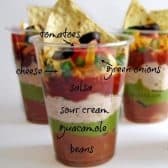 Individual 7 Layer Dip Cups! These are perfect to serve at any party or gathering… say perhaps a Superbowl Party!!! I like to serve them with little spoons to make it easy to scrape out the bottom of the cup!